In the previous search engine series, I demonstrated how to implement a naive fuzzy match using Levenshtein distance. I call it naive because the distance metric is based on matching the user’s query to matching words in the dictionary. In today’s blog post, I show how to extend that functionality across multiple words, taking into account spatial locality (an overloaded term) regardless of where they occur in the original document. I also show you how to add contextual highlighting of the user query of the search results. You can see from this diagram that when the user entered in multiple words, we would never get good matches unless the words were adjacent. The reason is simple: Two different words will never have intersecting potential matches. While they could have potential fuzzy matches, this result is erroneous signal. The easy and obvious fix for this is to split the user’s query by word, then conduct a fuzzy search through the index using all ngrams associated with those words. Much like we did for fuzzy searches with fuzzy ngrams, we move up one level of abstraction to N searches. This returns an array of array of Words, so we’ll need to flatten the array and then arrange them somehow. 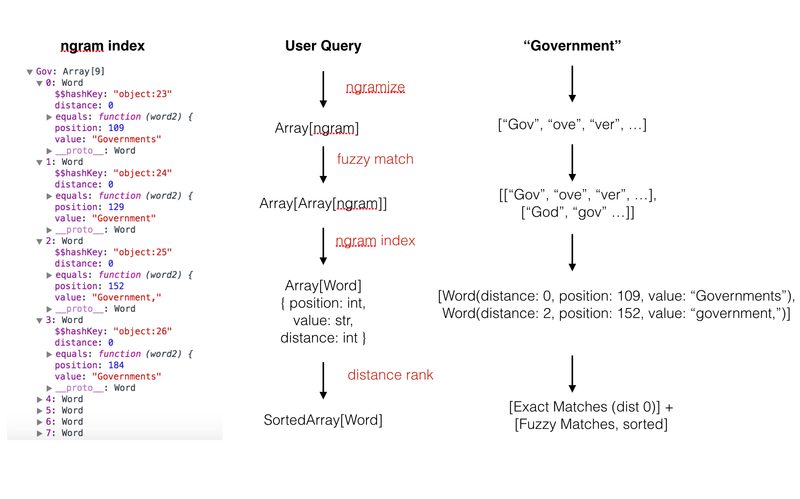 Since each search returns a set of exact and fuzzy matches, this implementation necessitates (as it did for fuzzy matches) another ranking scheme to arrange the results in order of relevance to the user. In my implementation, I opted for a quick and dirty solution of ranking via spatial locality (I know this is an overloaded term related to caching schemes). Essentially, based on the number of words of context, if any two results fall within the range, they form the same “result.” Note that since we are no longer matching 1 word at a time, I created a new class called a Result, which contains the string matching the search result’s context, gave it a new score (just an inverse distance calculation) and also added highlighting to the context. With this, we define the interface for a search result, and are abstracted away from words. You can see how using abstractions like this can be very powerful. Instead of words, we may create indices that point to documents. Then for each document, we can reference the correct index. In this manner, we can have distributed indices across a cluster and get faster lookups than storing all indices in memory on one machine. The score method itself is also very simple. It’s just an inverse distance metric, such that “exact matches” return a score of 1, whereas imprecise matches return a score of 1/(distance +1). Finally, as I traverse through the array of Words, when I find two words where the distance of the positions (in words) is less than the context, I increment the high and low position that was used to compute the context within the document. Then I aggregate the scores of the adjacent Words. If a Word has no neighbors within that range, the most recent positions are used to compute the Result. In the case where the Word is isolated, this just returns the same context as before. Where a Word had neighbors within range, this returns a context with a max range of (context * 2 + (highPosition – lowPosition)) words. We could truncate this to make all contexts the same size (but I opted not to). Finally, since we’ve been iterating through our results and combining Words to make new contexts, we have to sort the set by score. Highlighting is also a pretty easy add. When I instantiate a Result and push it into our results array, I have all the information I need to compute whether the result should contain highlighting or not. Simply by breaking apart the users query and using a string replace, we can return a html fragment ready to be rendered by the browser. That’s pretty much all it requires with this implementation. 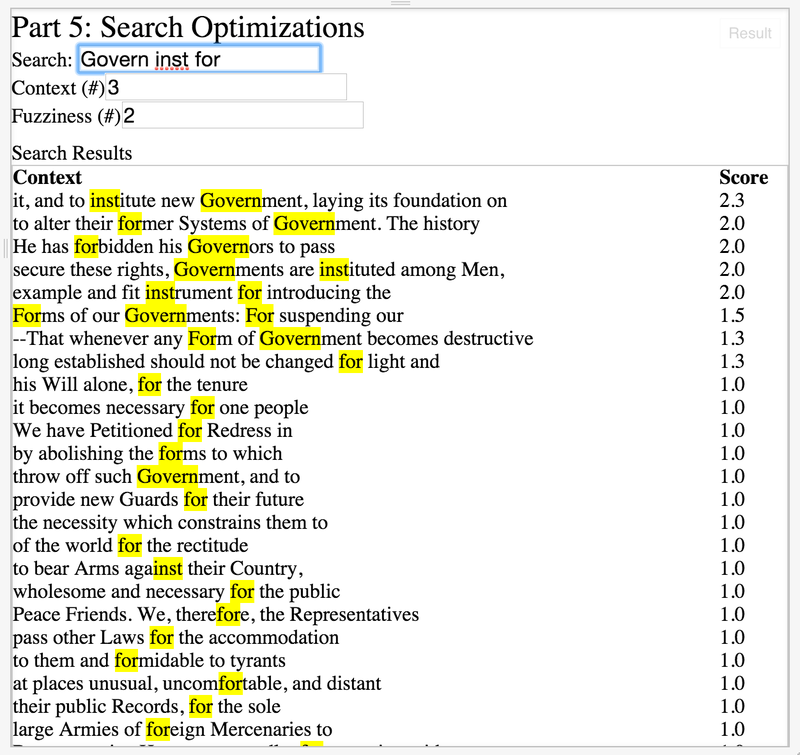 As this series is only meant to demonstrate how to implement some basic textual search techniques, it still doesn’t optimize for performance. We are still using extra space with our ngram index (storing each word) and are using O(n^2) to intersect the arrays of matches. It would be better to keep our indices sorted so we can have faster intersection time. Distributed indices would be a good idea. I briefly mentioned this above, but we have all the tools necessary such that we can also create indices of ngrams to documents instead of words. We can then use these ngram indices to filter out all documents that don’t match a user’s query, then use a pointer to another index to do the textual search within the document. Better ranking metrics. Additionally, my ranking algorithm is very basic and is based purely on distance and spatial locality. We could perhaps do something more useful, like score a Result differently depending on how many words apart each Word was. Also, because we use reuse the context variable, our maximum lookup range is small and likely wouldn’t even cover a sentence.